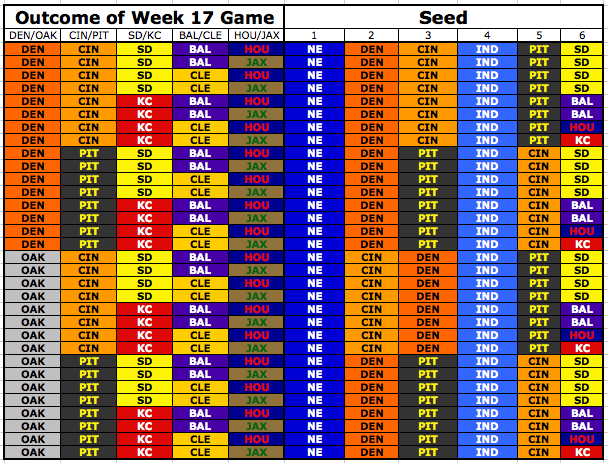 It's Week 17 for the NFL and that means that for a few teams the playoffs start today. There are some playoff spots still open and those will be the most interesting matchups to watch today. Here is a look at the playoff picture for both conferences before games start today. Now that we have that out there let's see who should win those games. Philadelphia at New York Giants - (FOX) Eagles rule and Giants drool. It's pretty much that simple now that both teams are out of the playoffs. The Eagles are clearly the better team with a bright future and the Giants might not have many current players on the team next year except for Odell Beckham Jr. The Eagles might have exactly the same roster aside from the QBs and Secondary. Not sure who wins here except for stupid Dallas fans. Ugh. Giants win 24-20 because Chip knows a loss here is more valuable to the organization and he is a maximizer of the highest order.